Sad news out of Knoxville: CBS's Gregg Doyel reports that Pat Summitt—head coach of Tennessee's women's basketball team and the most successful coach in NCAA history—has been diagnosed with dementia. She's just 59 years old. The diagnosis was early onset dementia, Alzheimer's type. Her initial reaction to learning she had a progressive condition that could impair her mental acuity was one of anger and denial. Since then, she's moved forward in more Summitt-like fashion, formulating a plan involving medication and mental activities, such as reading and doing puzzles at night before going to sleep. She's also taken a hopeful stance about her future. Summitt has every reason to retire; there's nothing in the sport she hasn't yet conquered. 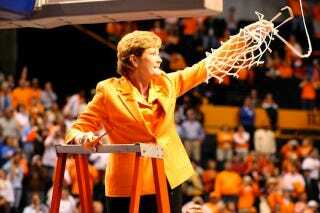 She has, Doyel reminds us, "1,071 career victories, eight national championships and an Olympic gold medal." But Summitt will still coach, because she's stubborn and great and because she can, and because, secretly, she probably wants one more shot at Geno. Doyel reports that former Tennessee players are flying into Knoxville "from all over the world" to see Summitt, but she's been characteristically headstrong in the wake of the news: "There's not going to be any pity party and I'll make sure of that," she told the News Sentinel. Or else: wind sprints, I'm sure.